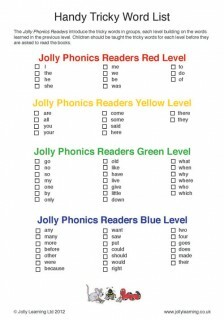 This Tricky Word list gives you a helpful breakdown of the Tricky Words in the first four levels of the Jolly Readers. A perfect way to make sure that any child has learnt to read the appropriate Tricky Words before you give them these wonderful decodable readers. Download your Tricky Word List here.